New Ceramic, September/October 2015 issue. 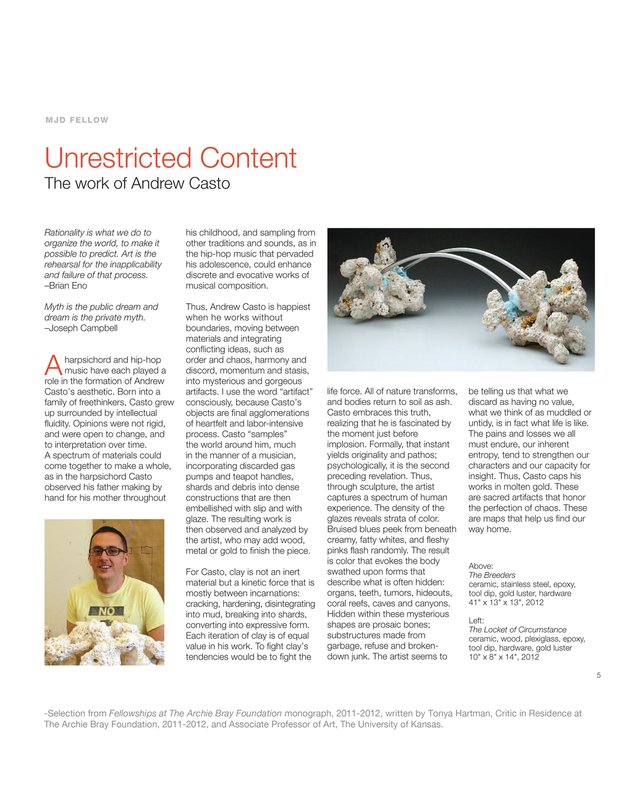 Ceramics Now, Issue 3, Summer 2015, Interview with Vasi Hirdo. Constructed, an invitational exhibition curated by Peter Christian Johnson at the The Nightingale Gallery, Eastern Oregon University. The Arizona State University Art Museum is renowned for its extensive and notable craft collection and features international acquisitions in wood, ceramic, and fiber. This book, edited by the museum's curators, uses the ASU collection to explore the idea of craft within a critical context, as both idea and action. Crafting a Continuum begins with the genesis of the craft collection and relates it to the historical development of craft in the United States and abroad, exploring both anthropological and cultural concepts of the field. — Jenni Sorkin, Assistant Professor of Art, UC Santa Barbara, as detailed in "Crafting a Continuum, Rethinking Contemporary Craft", Copyright 2013, The University of North Carolina Press.